How to install Ubuntu on a GPT partition table without using EFI boot? I'm planning to install a new Ubuntu system on an empty hard drive with more than 3TiB of volume. In order to fully utilize the drive, the regular MBR partition table can not be used. How do I set up a GPT partition table in the Ubuntu installation? The manual installation option only offers ways of setting up certain partitions, not a general partition table, if I am not mistaken. How do I make sure that the installer will not use the usual MBR partition table? Although my motherboard uses UEFI, there is no special reason for me to use another bootloader than the regular grub that I am aware of (except if it is easier to install on a GPT drive or significantly faster/more advanced). All guides I have found so far focus mainly on the mechanics of U/EFI boot. What steps do I have to take to basically set up a regular manual Ubuntu installation, but with a GPT partition table instead of MBR/grub? I assume the selection for the bootloader installation is also different in this case? 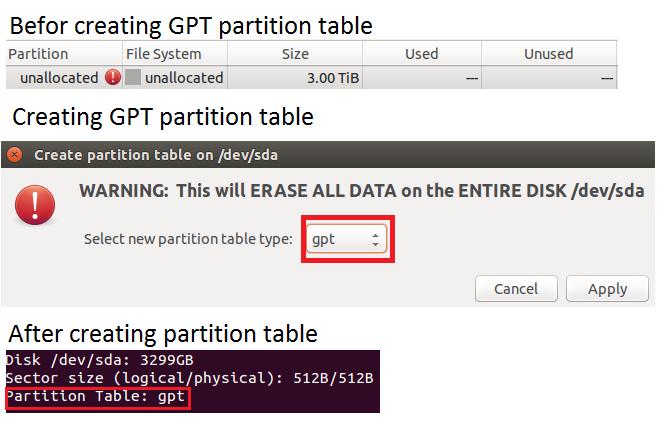 GPT partition table is specially used for Hard Disks sizes greater than 2TB. The partition table is independent of the BIOS mode (i.e Legacy or UEFI). Boot into the live USB or live CD containing Ubuntu. Click on TRY UBUNTU , so that you can create partition table manually. On the top of GParted Menu bar , click on Device --> Create partition Table. Select GPT from the drop down list and click on Apply. There you will see that the partition is GPT. Now install Ubuntu as usual , installation will not rewrite the partition table (partition table remains GPT only) but new partitions are created. Not the answer you're looking for? Browse other questions tagged boot grub2 partitioning uefi gpt or ask your own question. How can I set up GPT and EFI for my new raw drive? How can I change a drive's partition table from MBR to gpt without losing an NTFS partition at the end of the drive?